Tarpon are, hands down, my favorite fish that swims in the ocean. Not only are they big, powerful and fast, but they jump like crazy and shake their heads so violently when airborne that you can hear their gill plates rattling and see blood flying. In some ways, they can be one of angling’s greatest challenges yet are also readily available and can be targeted by anyone. 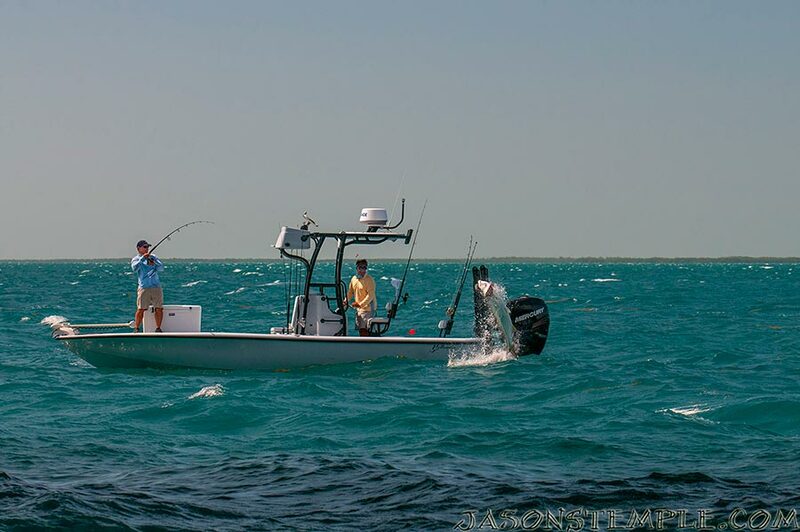 They are around in some form or another year round in the Keys, but the main focus is on the annual spring migration, when thousands of adult tarpon show up in the Keys and thousands of anglers follow. This Saltwater Experience shoot happened to line up at the end of May, right in the middle of it. Of course, this May ended up being an incredibly windy one, so we decided to head a little further down the Keys from Hawk’s Cay to fish the Bahia Honda bridges. 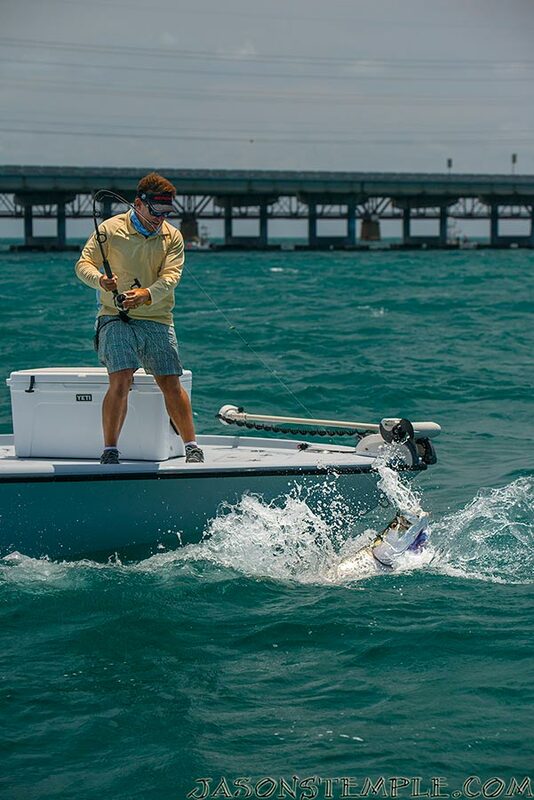 The Bahia Honda area holds an incredible amount of tarpon during the season and also has a good lee from the wind, which was relentless. 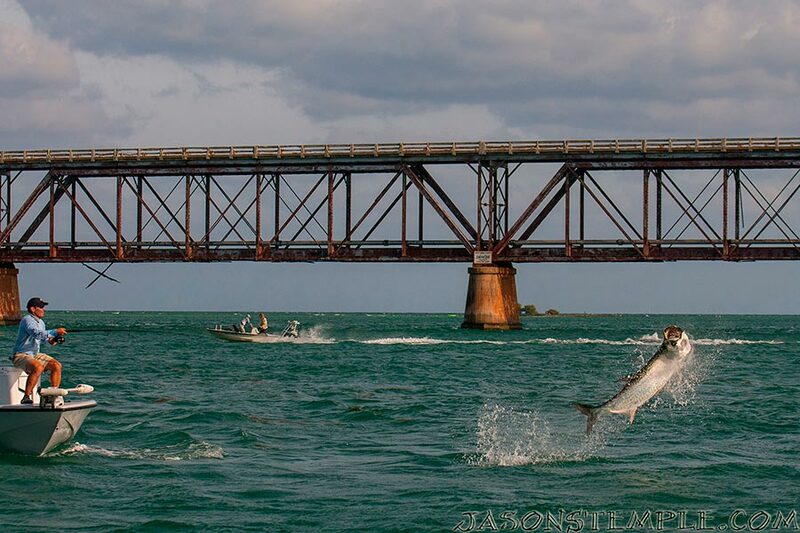 I was fired up for this day, as I had never done the bridge tarpon thing, and I just love shooting flying tarpon. 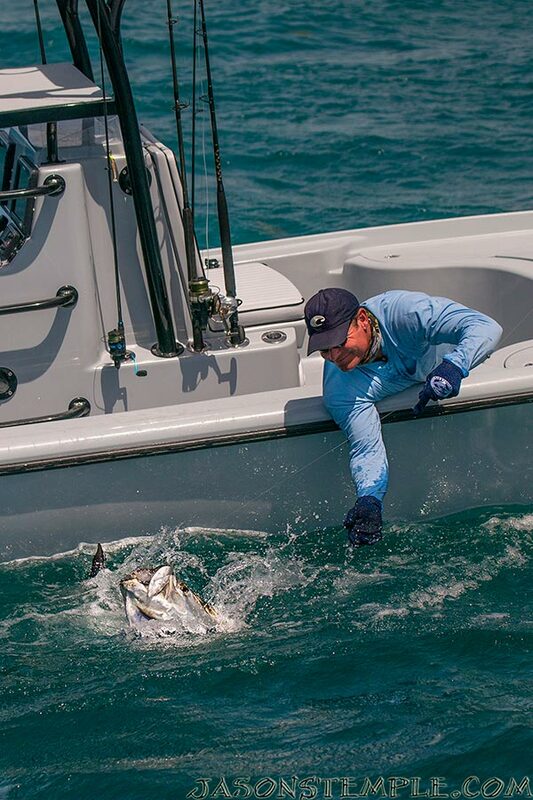 As I mentioned last week, airborne tarpon are one of the tougher subjects to capture, so I’ll talk a little about the challenges and how I address them. 1. They are fast and are shaking violently when in the air. 2. Where and when they will jump is unpredictable. 3. They are extremely reflective. 4. Your platform is moving. 5. Light conditions are constantly changing on the water. Before I talk about the specific challenges, I thought would outline the gear I use for this type of shooting. In my pelican case, which I leave out on the deck of the boat I have 2 cameras ready to go. One is a Nikon D800 with a 16-35mm zoom lens. It let’s me get extremely wide angle shots, which can include a whole boat and jumping fish, or an angler in the foreground and a jumping fish in the distance, while I am standing right behind the angler. The other setup is a Nikon D300s with a 70-200mm zoom, which gives me a little more reach to get fish jumping a ways in the distance as well as pretty close to the boat. The D300s also has the speed to rattle off 5-10 photos while a tarpon is in the air. I will often have both these cameras hanging around my neck ready to go. One of the biggest challenges you have to deal with is speed. You need to shoot with a fast shutter speed to freeze the action. Some prefer to do this using shutter priority mode. I prefer aperture priority mode, so I can shoot wide open or close to it, and let the camera adjust to the fastest shutter speed possible depending on the light. I generally set my ISO to 400 or maybe up to 800 when it’s a little darker out, which helps me get a higher shutter speed, without the quality suffering too much. It’s pretty easy to shoot a day of tarpon fishing and come home with a memory card full of splashes and tails shooting out the side of the frame. It takes some time to be able to judge where and when a tarpon will jump. It helps to listen to the angler and guide, and hopefully be able to stand close to and just off the shoulder of the angler, so you can track the line. I spend a lot of time shooting boat to boat from a camera boat, but prefer to shoot jumping fish on board with the anglers for this reason. Tarpon are an extremely reflective fish, so when they leave the water, their scales will light up with flashes from the sun. It’s awesome to see, but plays havoc with your camera’s sensor and metering system. It’s very easy to blow out a good portion of the fish, and have absolutely no information in that portion of the image to retrieve later in Photoshop. For this reason, I generally shoot jumping tarpon from 1 to 2 stops underexposed and lighten up the image later in the digital darkroom (with this method, you get the added bonus of gaining shutterspeed). Whether you are on board with the anglers or shooting boat to boat, your platform is moving, as is your target. So, safety for you and your gear is important. Sitting down is often a good idea if it’s an option. Otherwise, I try to make sure I keep my feet spread out to shoulder width, keep my knees bent a little and use different parts of the boat to lean against for stability. When I flyfish from a skiff, I like to be barefoot, but when I’m on the water shooting, I wear quality sneaker style boat shoes. 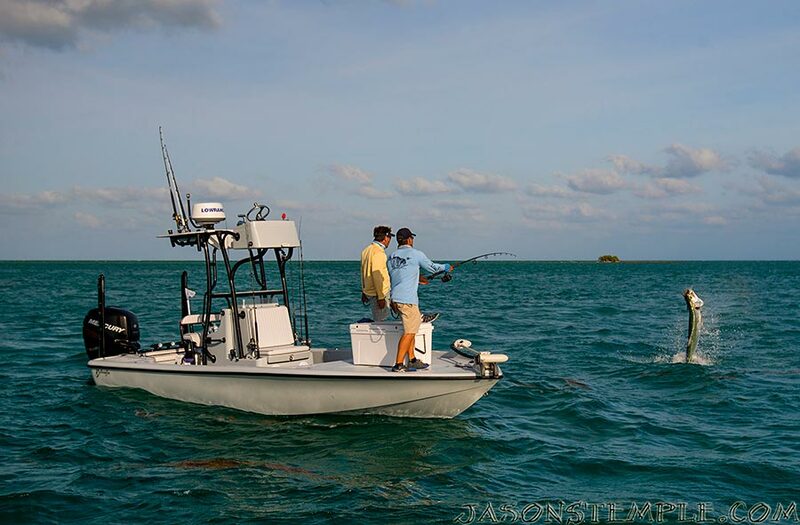 As you follow fish around the boat at high speed, light conditions will rapidly change. As I mentioned before, I like to shoot on aperture priority and underexpose by a stop or two. This generally leaves me with some work to do on the computer, but with professional gear and Photoshop skills this is what gives me the best rate of success. Don’t be frustrated if you come home with nothing worthwhile, everybody gets blanked on good images at times when shooting jumpers. It takes a lot of clicks of the shutter and a lot of practice.